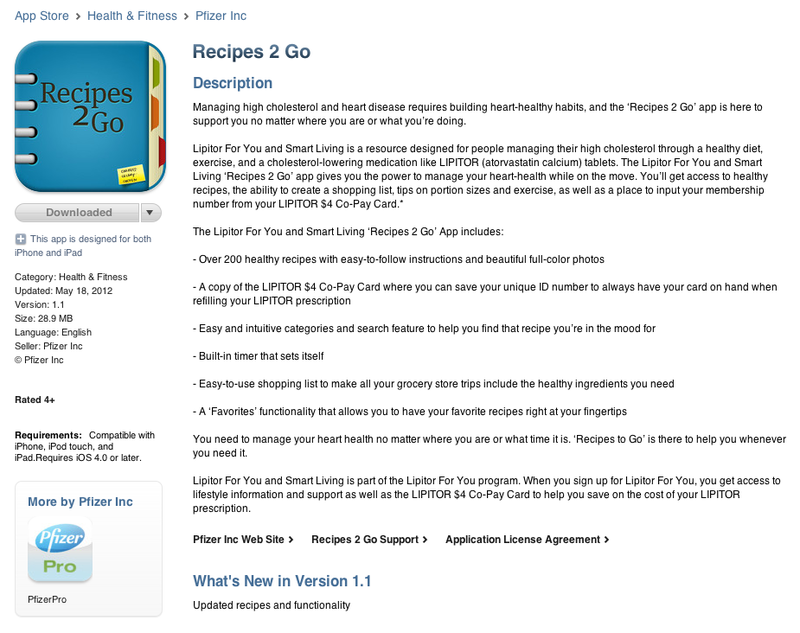 Pharma Marketing Blog: Recipes 2 Go: Pfizer's LIPITOR-Branded iPhone App. Is It an Ad FDA Should Review? Recipes 2 Go: Pfizer's LIPITOR-Branded iPhone App. Is It an Ad FDA Should Review? I just learned that Pfizer has developed an iPhone/iPad app that promotes LIPITOR, the drug company's off-patent lipid-lowering drug. The app is "Recipes 2 Go." It is the first pharmaceutical app that I know of that promotes a prescription drug. The description -- shown here in its entirety -- mentions LIPITOR and the FDA-approved indication, which is managing high cholesterol. Is This an FDA-regulated Drug Ad? My question: Does this iTunes page qualify as an prescription drug ad that must comply with FDA regulations regarding fair balance (ie, Important Safety Information or ISI)? If it does qualify, then it violates FDA regulations because the page does not include ANY fair balance or a link to the full prescribing information. Did Pfizer submit this page to FDA for regulatory review? Did it submit the page to its own MLR (medical/legal/regulatory) people? Only when you scroll down to the next screen do you see the notice "Scroll down to see Important Safety Information," which appears about 14 screens further down! Whew! That's a lot of scrolling! The multi-page End-User Agreement (dated April 20, 2012) should be read carefully. For one thing, it states that "NO STATEMENTS MADE IN THIS SOFTWARE HAVE BEEN EVALUATED BY THE FOOD AND DRUG ADMINISTRATION." To which I say, Why Not? The FDA should definitely take a look at this app and decide if it complies with regulations. This is great Blog post. Thank you for uncovering this. I think this could very well be considered an advertisement. The first sentence of the description mentions the indication and the second paragraph lists the brand (also elsewhere in the description. So the FDA could consider the description an advertisement. The Apple app store listing certainly does not have any fair balance or link to the full prescribing information. The questions that arise from this are: 1) will the FDA review this?, 2) is it a violation? As for the app itself, it contains a lot more information. I think this is maybe the first app that has required that I actively agree to a End-user agreement. There is safety information on the "my favorites" section with a link to the Patient Prescribing Information (PPI). However on the iPad app I downloaded, it did not work the first time I clicked on it. A second try got it to open what appears to be a PDF document - try reading that on an iPhone for anyone over 45 y/o. The about us page also lists safety information and has the same link to the PPI. In the iPad landscape orientation it was on the fourth screen and the link to the PPI was at the very bottom. There is no guarantee that this would pass FDA review if in fact they review it and some time. I have seen other apps and mobile optimized websites or "webapps" that contain pop up safety information or that maintain a scrolling text box at the top of the window with important safety information. I think the outcome will be important learnings for Pharma companies and their agencies that develop mHealth initiatives and health applications. I hope that you will keep us updated on any developments. It will be interesting to follow this story -stay tuned! The timing of the app's launch is even more curious given the fact that Pfizer announced a couple of weeks ago that it is suspending its promotion of Lipitor (see http://pharmamkting.blogspot.com/2012/05/pfizer-throws-in-lipitor-marketing.html). I suspect that this app was under development for many months and its launch may have been delayed as often happens with software development. In any case, the money was spent, so you might as well release the app no matter what you have said about discontinuing other traditional promotions. Obviously, the app is really geared to getting people to sign up for the $4 co-pay card, which, I believe, Pfizer is committed to support at least until the end of the year even though it hasn't helped sales much so far (see http://pharmamkting.blogspot.com/2012/05/pfizers-lipitor-co-pay-cardpbm-discount.html). Thank you for covering this! I am having trouble locating it in the store now. Has it been taken off already?? If not, would you mind posting a link? This GEVEY unlock solution for the iPhone four will not require a jailbreak however requires manual configuration. A full plug-and-play unlock methodology for iOS 4.three.three is offered after jailbreak. Redsn0w is that the ONLY supported jailbreak methodology. the website cannot supply phone support for jailbreaking your iPhone, but we tend to'll facilitate your with different installation queries.